Gimhae Airport is the international airport closest to Ulsan, operating out of Gimhae, a small city to the east of Busan. There are a number of ways to get to the airport and this article will show you the best ways to get there. Please note times and rates are subject to change. This bus departs from the Taehwa Bridge underpass, by Taehwa Rotary. The ticket booth is beside the crosswalk leading to the Taehwa River Park (on the left side of the bridge, if you’re facing the river). You’ll see the buses parked in the lot under the bridge. Thanks to Youngjun Han for this handy picture-diagram! It begins at 5:00 am and runs until 7 pm, at 20-30 minute intervals. The bus takes approximately 1.5 hours, though this varies with traffic. It also stops at the Shinbok Rotary bus stop in Mugeodong, then Eonyang (next to Cheonil Express) and then Tongdosa. It costs approximately 7,900 won (6,100 won from Eonyang). The Taehwa and Shinbok bus stops are marked on the Interactive Map, under Transportation. From Gimhae airport, the service starts at 6:35 am and runs until 10:15 pm. The stop is to the far right when you exit either terminal. Tickets are bought at the Domestic Terminal, which is the 2nd stop, so you may have to get off the bus there to buy your ticket. Taxis are available for approximately 120,000 won, though some people have reported negotiating rates of 70,000 won to downtown Ulsan from Gimhae Airport. This is probably the worst and most expensive way to get to the airport. However, if you absolutely need to get to the airport then it is an option. If you’re unable to take the Limousine Bus, and don’t want to cough up the cash for a taxi, there are a few other options available. Please note that Gupo KTX station, while close to Gimhae, does not have trains that go to Ulsan, as the line branches before Gupo. From Taewhagang* Station, take a train to Haeundae (approximately 1 hr), then hop the subway (Jangan Station – 15 min walk from the new Haeundae Station) out to the Gimhae Airport stop (approximately 1 hr), transferring at Sasang to the Gimhae Light Rail (Kaya Univ direction). Train to Haeundae is 3,200 won (2,700 won standing), subway 1,900 won if you have a T-card (slightly more if not). From Ulsan Intercity Bus Terminal, take a bus to Haeundae (approximately 1 hr 15 mins), then take the subway/Light Rail as above. This bus also stops at the Ulsan Grand Park main entrance, by Gonguptap Rotary, marked on the Interactive Map under Transportation. The fare is approximately 4,000 won for the bus, 1,900 won for subway (T-card price). There are also Limousine buses from various hotels and attractions in the Haeundae/Gwangali area. For more information on stops, check out the Transportation info on the Airport website – buses 16 and 17. Busan City Bus 307 also runs between Gimhae Airport and Haeundae. 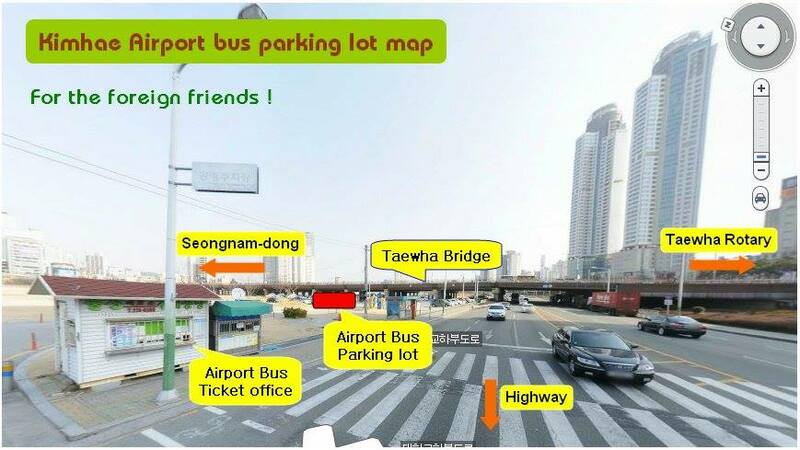 From Taewhagang* Station, take the train to Bujeon (approximately 1 hr 20 mins), then take the subway to Gimhae Airport (approximately 40 mins), transfering to Line 2 at Seomyeon (Yangsan direction), and the Busan/Gimhae Light Rail at Sasang (Kaya Univ direction). Train tickets are 4,100 won (3,500 won standing), subway is 1,700 won (T-card price). From Ulsan Station, take the train to Busan Station (approximately 20 mins), then take the subway to Gimhae (approximately 45 mins), transfering to Line 2 at Seomyeon (Yangsan direction) and the Busan/Gimhae Light Rail at Sasang (Kaya Univ direction). Please note that from downtown Ulsan it can take between 30-45 mins to get to Ulsan Station, as it’s near Eonyang. Train tickets are 13,200 for first class, 8,400 for economy or 8,000 for standing. Subway is 1,900 won (with a T-card). Buses run from the Intercity Bus Terminal in Samsandong to Nopodong Station in Busan (approximately 45 mins – 1 hr). There is also a stop by Munsu Stadium in Mugeodong, which is marked on the Interactive Map. From Nopodong, you can take the subway to Gimhae (approximately 1 hour), transfering at Seomyeon (Yangsan direction) and Sasang (Kaya Univ direction). Follow any of the above steps in reverse. Limousine buses leave from clearly marked stops outside of the terminals, and the information desk can tell you when the next bus leaves, and where to get a ticket. Taxi drivers will accost you in the terminal. Try bargaining with them – anywhere around 100,000 won is a pretty decent deal. There will be signs in the terminals directing you to the Gimhae Light Rail, which transfers at Sasang to the Busan Subway system. Thanks to the UlsanOnline Facebook group members who have helped compile this information.